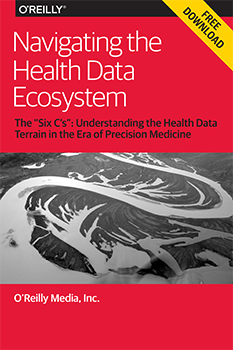 The "six C's": understanding the health data terrain in the era of precision medicine. Ian Eslick, Tuhin Sinha, and Rob Rustad contributed to this post. Download a free copy of “Navigating the Health Data Ecosystem,” the first in a series of reports covering our recent investigation into the health data ecosystem, funded by the Robert Wood Johnson Foundation. From that early thinking, we developed the framework for a grant with the Robert Wood Johnson Foundation (RWJF) to explore the technical, organizational, legal, privacy, and other issues around aggregating health-related data for research — to provide empirical lessons for organizations also interested in pushing for data in health care initiatives. Our new free report, Navigating the Health Data Ecosystem, begins the process of sharing what we’ve learned. After decades of maturing in more aggressive industries, data-driven technologies are being adopted, developed, funded, and deployed throughout the health care market at an unprecedented scale. February 2015 marked the inaugural working group meeting of the newly announced NIH Precision Medicine Initiative designed to aggregate a million-person cohort of genotype/phenotype dense longitudinal health data, where donors provide researchers with the raw epidemiological evidence to develop better decision-making, treatment, and potential cures for diseases like cancer. In the past several years, many established companies and new startups have also started to apply collective intelligence and “big data” platforms to health and health care problems. All these efforts encounter a set of unique challenges that experts coming from other disciplines do not always fully appreciate. In 2014, the Robert Wood Johnson Foundation funded the subject of this report, a research effort called “Operationalizing Health Data,” as a deep dive into the health care ecosystem, focused on understanding and advancing the integration of personalized health data in both clinical and research organizations. RWJF encouraged the small group of data scientists, innovators, and health researchers working on the grant to find and prototype concrete solutions for several partner organizations trying to leverage the value of health data. As a result, the focus of our research intends to empirically inform innovations teams, often coming from non-health-related industries, about the messy details of using and making sense of data in the heavily regulated hospital IT environment. Our first in a series of four reports covering our findings from the grant describes key learnings identified by the project across six major facets of the health data ecosystem: Complexity, Computing, Context, Culture, Contracts, and Commerce. In future reports, we will focus on specific tactical challenges the project team addressed. Download a free copy of Navigating the Health Data Ecosystem.